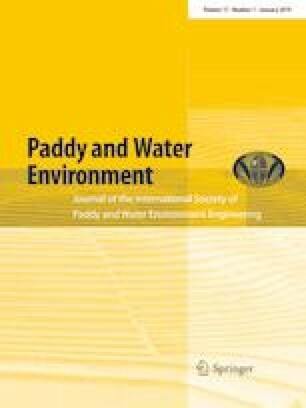 Projection of future changes in agricultural water demand and supply through numerical model simulations can be one of the reference materials used for long-term rural planning under climate change. With a distributed hydrological model incorporating an agricultural sub-model, time-series rice growth and its yield can be simulated in correspondence with time-series soil moisture simulated by a hydrological model. Whereas such an agro-hydrological model is useful for assessing the climate change impact on agriculture in that it can simulate the potential rice production and the water-related damages on it against the given rainfall and meteorological condition, one of the challenges in simulating a realistic situation by a model is how to give a planting date in the model in regions where it is not fixed to a certain calendar date and differs in different fields and in different years. In this study, we examined an algorithm to estimate planting date in paddy fields using satellite data. The data we used are the 16-day composite Enhanced Vegetation Index (EVI) product by the moderate resolution imaging spectroradiometer (MODIS), which provides global coverage with 250-m spatial resolution. The time series of the EVI values at each pixel was analyzed first to detect heading dates as the local maxima in each year. Considering the number of days for growing rice, the existence of the second and the third rice cropping was judged from the time intervals of the local maxima. The planting dates were then estimated from the determined heading dates and local minima of the EVI time-series EVI. The estimated planting dates were validated against national statistical data in Japan and also with field-surveyed data in Cambodia. They showed reasonable estimations in the areal statistics, but there remained gaps in the comparison at individual fields. Parts of this research were supported by the Japan Society for the Promotion of Science (JSPS) KAKENHI Grant Numbers JP16K06503, JP17H04484, and JP17H01496. We thank the anonymous reviewers for their insightful comments which helped us greatly in improving the manuscript from its earlier version.